Unions have been compared across countries by growth and decline patterns, by violence levels, and by kinds of political activity. 95% in Sweden and Denmark. Over 50% in Australia, Ireland and the United Kingdom. Over 30% in West Germany. In 1987, United States unionization was 37 points below the average of seventeen countries surveyed, down from 17 points below average in 1970. Between 1970 and 1987, union membership declined in only three other countries: Austria, by 3%, Japan, by 7%, and the Netherlands, by 4%. In the United States, union membership had declined by 14%. In 2008, 12.4% of U.S. wage and salary workers were union members. 36.8% of public sector workers were union members, but only 7.6% of workers in private sector industries were. The most unionized sectors of the economy have had the greatest decline in union membership. From 1953 to the late 1980s membership in construction fell from 84% to 22%, manufacturing from 42% to 25%, mining from 65% to 15%, and transportation from 80% to 37%. The General Confederation of Labour (CGT) is a national trade union center, the first of the five major French confederations of trade unions. Until the 1990s it was closely linked to the French Communist Party (PCF). It is the largest in terms of votes (32.1% at the 2002 professional election, 34.0% in the 2008 election), and second largest in terms of membership numbers. Its membership decreased to 650,000 members in 1995–96 (it had more than doubled when Socialist François Mitterrand was elected President in 1981), before increasing today to between 700,000 and 720,000 members, slightly fewer than the Confédération Française Démocratique du Travail (CFDT). According to the historian M. Dreyfus, the direction of the CGT is slowly evolving, since the 1990s, during which it cut all organic links with the Communist Party, in favour of a more moderate stance. The CGT is concentrating its attention, in particular since the 1995 general strikes, to trade-unionism in the private sector. The French Democratic Confederation of Labour, CFDT is one of the five major confederations. It is the largest French trade union confederation by number of members (875,000) but comes only second after the Confédération générale du travail (CGT) in voting results for representative bodies. The CFDT was created in 1964 when a majority of the members of the Christian trade union Confédération Française des Travailleurs Chrétiens (CFTC) decided to become secular. The minority kept the name CFTC. Labour unions emerged in Japan in the second half of the Meiji period, after 1890, as the country underwent a period of rapid industrialization. Until 1945, however, the labour movement remained weak, impeded by lack of legal rights, anti-union legislation, management-organized factory councils, and political divisions between “cooperative” and radical unionists. In the immediate aftermath of the Second World War, the US Occupation authorities initially encouraged the formation of independent unions. Legislation was passed that enshrined the right to organize, and membership rapidly rose to 5 million by February 1947. The organization rate peaked at 55.8% of all workers in 1949 and subsequently declined to 18.5% as of 2010. The unionization rate in the U.S. and Canada followed fairly similar paths from 1920 to the mid-1960s; both peaked at about 30%. However the U.S. rate declined steadily after 1974 to 12% in 2011. Meanwhile, the Canadian rate dropped from 37% the mid-1980s to 30% in 2010. Part of the reason is the different mixture of industry, and part is due to more favourable Canadian laws. Labor unions first developed in Costa Rica in the late 1880s. The first unions were organized with the help of the Catholic Church. By 1913, the first International Workers Day was celebrated and unions, supported in particular by the Popular Vanguard Party, pushed for Alfredo González Flores' tax reforms. Unions grew in number and coverage. A major historical event for Costa Rican labor was the 1934 United Fruit Company, a national strike involving more than 30 unions which ended with many labor leaders imprisoned. Head of state Teodoro Picado Michalski violently repressed union leaders, leading to the tensions that created the 1948 Costa Rican Civil War. Labor unions continued to grow, supported by the Catholic church, and the first collective bargaining agreement was reached in 1967. Óscar Arias fought fiercely to dissolve and reduce the power of private sector unions in the 1980s. Arias' austerity measures led to a period of increased labor activity as poverty and unemployment increased. Despite the resurgence, unions, particularly in the private sector, still faced opposition and repression. During the 2007 Central American Free Trade Agreement referendum, labor unions unsuccessfully organized to encourage its rejection. They received a boost in political influence when Luis Guillermo Solís and his Citizens' Action Party earned the Presidency and several seats in the Legislative Assembly. Labor unions are active in both the public and private sectors. Major concerns include salaries increased to reflect inflation, regulation of public commodities, and a stronger Caja Costarricense del Seguro Social (Costa Rican Social Security Department). Many labor unions are also asking for increased environmental regulation, and increased oversight of cooperative banks. One important issue for Costa Rica unions is passage a new labor law. Former president Laura Chinchilla vetoed it, but Solís appears to want the issue passed, as do many members of the Legislative Assembly. Economists have explored the linkage between unionization and levels of overall GDP growth and unemployment, especially in light of the high unemployment in Europe since the 1980s and the stagnation in growth rates. On both the theoretical and the empirical sides, experts have not reached any consensus. Between 1877 and 1968, 700 people have been killed in American labor disputes. In the 1890s, roughly two American workers were killed and 140 injured for every 100,000 strikers. In France, three French workers were injured for every 100,000 strikers. In the 1890s, only 70 French strikers were arrested per 100,000. For the United States, national arrest rates are simply impossible to compile. In Illinois, the arrest rate for the latter half of the 1890s decade was at least 700 per 100,000 strikers, or ten times that of France; in New York for that decade it was at least 400. Between 1902 and 1904 in America , at least 198 people were killed, 1,966 workers were injured. One worker was killed and 1,009 were injured for every 100,000 strikers. Between 1877 and 1968, American state and federal troops intervened in labor disputes more than 160 times, almost invariably on behalf of employers. Business was disrupted, usually by strikes, on 22,793 occasions between 1875 and 1900. 1 2 Blanchflower, David and Richard B. Freeman (April 1990). "Going Different Ways: Unionism in the U.S. and Other Advanced O.E.C.D. Countries". National Bureau of Economic Research. Working paper number 3342: 6, 42. doi:10.3386/w3342. ↑ Sexton, Patricia Cayo (1992). The War on Labor and the Left: Understanding America's Unique Conservatism. Westview Press. ISBN 0-8133-1063-6. ↑ Bureau of Labor Statistics (January 28, 2009). 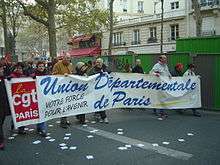 "Union members in 2008". Washington, D.C.: U.S. Department of Labor. Greenhouse, Steven (January 28, 2009). "Union membership up sharply in 2008, report says". The New York Times. p. A18. Whoriskey, Peter (January 29, 2009). "American union ranks grow after 'bottoming out'; first significant increase in 25 years". The Washington Post. p. A8. ↑ Troy, Leo S.M. Lipset Editor (1986). "The Rise and Fall of American Trade Unions: The Labor Movement from FDR to RR". Unions in Transition: Entering the Second Century, Institute of Contemporary Studies: 87. ↑ Troy, Leo (May 1987). "New Data on Workers Belonging to Unions, 1986". Monthly Labor Review: 36. ↑ Troy, Leo (Spring 1990). "Is the U.S. Unique in the Decline of Private Sector Unionism". Journal of Labor Research. 11:2: 135. doi:10.1007/bf02685383. ↑ George Ross, Workers and Communists in France: From Popular Front to Eurocommunism (1982). ↑ C. Weathers, "Business and Labor," in William M. Tsutsui, ed., A Companion to Japanese History (2009) pp. 493-510. ↑ "Historia del Sindicalismo". SITRAPEQUIA website (in Spanish). San José: Sindicato de Trabajadores(as) Petroléros Químicos y Afines. 2014. Retrieved 4 May 2014. 1 2 3 4 Rojas Bolaños, Manuel (November 1978). "El desarrollo del movimiento obrero en Costa Rica: un intento de periodización" [The development of the workers' movement in Costa Rica: an attempt to create periods] (PDF). Revista de Ciencias Sociales (in Spanish). San Jose: Universidad de Costa Rica. 15-16: 13–31. ↑ Blanco Vado, Mario A.; Trejos París, María Eugenia (May 1997). "EL SINDICALISMO EN EL SECTOR PRIVADO COSTARRICENSE" (Compilation of articles). Revista Jurídica Electrónica (in Spanish). Centro de Estudios Superiores de Derecho Público. Retrieved 4 June 2014. ↑ Hidalgo, Juan Carlos (31 January 2014). "Costa Rica's Wrong Turn". The New York Times. New York. Retrieved 5 May 2014. ↑ Haglund, LeDawn (July 2006). "Hard Pressed to Invest: The Political Economy of Public Sector Reform" (PDF). Revista Centraamericana de Ciencias Sociales. 1, III. Retrieved 5 May 2014. 1 2 Kane, Corey (1 May 2014). "Labor voices optimism over new administration, takes parting shots at Costa Rica's Chinchilla". The Tico Times. San Jose. Retrieved 4 May 2014. 1 2 Oveido, Estaban (6 May 2014). "Luis Guillermo Solís avala plazo de un año para resolver veto a reforma laboral". La Nacion (in Spanish). San Jose. Retrieved 6 May 2014. ↑ Sequeira, Aarón (2 May 2014). "Presidente del Congreso se reúne con sindicatos y promete cambios al Código de Trabajo". La Nacion (in Spanish). San Jose. Retrieved 5 May 2014. ↑ Gitelman, H.M. (Spring 1973). "Perspectives on American Industrial Violence". The Business History Review. 47 (1): 2. doi:10.2307/3113601. ↑ Forbath, William E. (April 1989). "Law and the Shaping of the American Labor Movement". Harvard Law Review. 102 (6): 1186. doi:10.2307/1341293. ↑ An introduction to the study of organized labor in America. Macmillan. 1916. ASIN: B0008B9BBK. Blanchflower, David and Richard B. Freeman (April 1990). "Going Different Ways: Unionism in the U.S. and Other Advanced O.E.C.D. Countries". National Bureau of Economic Research. Working paper number 3342: 6, 42. doi:10.3386/w3342. ICTUR et al.,, ed. (2005). Trade Unions of the World (6th ed.). London: John Harper Publishing. ISBN 0-9543811-5-7. Lucifora, Claudio, and Dominique Meurs. "The public sector pay gap in France, Great Britain and Italy." Review of Income and Wealth 52.1 (2006): 43-59.